John was a pleasure to work with. He listened carefully and delivered what we wanted. He came in on time and on budget, and best of all, his close attention to his work produced a beautifully crafted product. We are thoroughly delighted with our kitchen remodel. "We had decided to remodel the kitchen, utility room, and two bathrooms. We were referred to John Weber, met with him, and were impressed with his professionalism, organizational skills, and methodology. He was very personable, interested in what we wanted, and was very good at assisting us with ideas and suggestions. We especially appreciated how he worked the cost estimates including the differences in quality and types of materials we wanted to use. Because the house was pretty dated, we gutted most of the rooms. It was scary, but with Johns direction and continued consultation, we now have a beautiful home. We were so pleased that we had him return the following year to replace the doors and trim throughout the home. We saved costs with his ability to do most of the work himself. He is an excellent visionary and pays close attention to detail. We recommend him to anyone who wants quality work". "Remodeling can be a daunting task! John walked us through each step by listening to our wants and needs, and using his professional experience to be sure the job was done in a timely and thorough manner. We were updated on a daily basis. He let us know what tasks we needed to complete, to keep the project on-track. He made sure that the subcontractors treated our project with the same level of care that he had. His constant attention to detail has resulted in a home that we truly love. 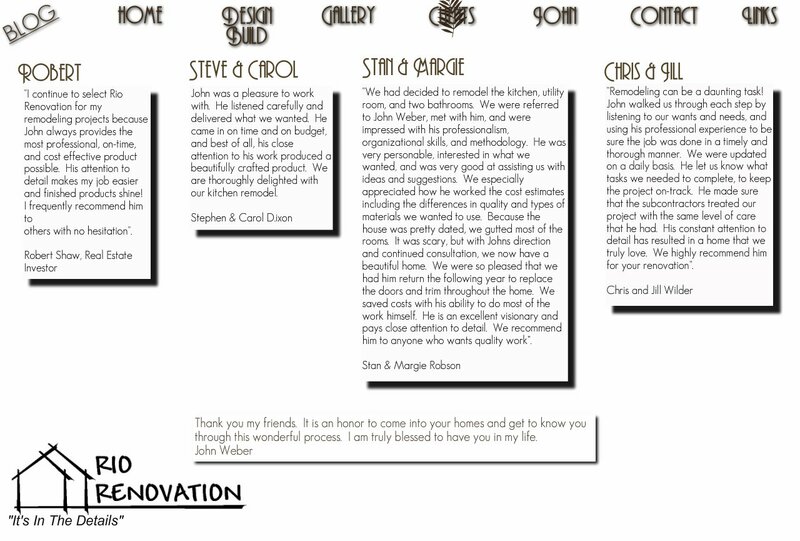 We highly recommend him for your renovation".